We must never honor despotism\'s hunger for conquest and bloodshed if we ourselves wish to remain free. Those who endorse and embrace hate were, and are not victims, they are the perpetrators of violence, and should not be coddled but vanquished. Many Jews who survived the death camps went to Israel. seeking a safe haven. One heroic American Rabbi (Rabbi Meir Kahane) proclaimed “Never Again.” Nathan Hale, in an act of defiance, declared, “I only regret that I have but one life to give for my country.” What do these two proclamations have in common? Why did they have such a powerful impact? Each one has captured the essence of the convictions around which all can rally in order to defend against and defeat an enemy that threatens to destroy them. I am convinced that “Never again is NOW” is that rallying call, for Ahmandinejad and the mullahs of Iran must not be given a chance to achieve their unequivocal announced and pursued goal. There is something wonderful I wish to share with you today, a way forward out of the darkness of despair.and a clear path to victory. 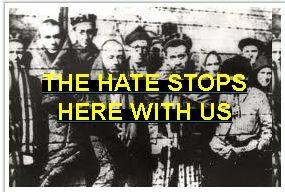 In 2008 at a United Nations rally, I encountered some survivors of Auschwitz who let me know in no uncertain terms that destroying what they called the Iranian nuclear death chambers is what their friends, who died in the death camps, are calling out from their graves. As the child of a survivor of the Russian pogroms it occurred to me that day at the rally there would be no greater way for all who truly want to grasp the meaning of what the Jewish people are facing at present than to don a symbol that unmistakably professes to one and all, “I am a Jew who refuses to again go silently into the night.”The Nazis forced the Jews to wear a large Star of David with “Judif” on their clothes for all to see, so the Jews would become a visible target for hatred, daily beatings, and slaughter. Now, sixty years later, time has dulled the memory of past atrocities and weakened the vigilance to an impending crisis that the Jewish people again face from those who wish to exterminate us.To bring attention to this lethal set of circumstances waking those who are again in denial must be our focus. Thus I am requesting you to wear the Star of David on your clothes, just as the Jews wore in Germany – except theirs said “Judif” and ours says “Never Again is Now.” As we have the great honor to represent those same Jews and evoke the voices of resistance, we vow that we will not be victims of hatred, not now, not ever again. With those in agreement, I urge at the beginning of any meeting or event in setting protocol for addressing the business of securing the survival of the Jewish people and the Jewish state – to give credence to the decree that “Never Again, means Never Again.” Declare, for example, “Today my name is Eliezer Arav, because the real Eliezer died at the hands of the Nazis in 1943, in the Holocaust. Yet, I hear his voice loud and clear, therefore, I proclaim that I am that Jew today. And in his name, I affirm we must destroy that place of hell on earth, destroy Iran’s nuclear holocaust machine now. Six million voices must be heard. Can you image if one day in Congress, all our representatives and senators wearing this button spoke directly to Ahmadinejad and said, yes, the holocaust did occur, and today on behalf of the all victims, be assured Never Again, means Never Again. Let this button be your symbol of resistance and restored courage as we move forward, reclaiming ownership of that vision of a world freed from hate, tyranny and oppression. For the sake of all who paid the ultimate sacrifice defending the freedoms we enjoy today, for those who died in concentration camps at the hands of monsters, we must not falter in our obligation to alert mankind that the “Never Again Alarm Bell” that is ringing in Israel, is ringing throughout the entire free world. What will happen to America if she does not take action against those who vow to destroy her ally Israel through nuclear annihilation or willfully endorse a suicidal peace agreement? America will lose her identity as the advocate for the advancement of freedom in this world, and inherit all that she fought against since the birth of the nation. Preventing such a cataclysmic occurrence necessitates nothing less than our full commitment to triumph over evil. We hold that miracle in our hands, Six Millions Voices Must be Heard Through Us.